Similar to heart attack, the Stroke is known as the brain attack due to blockages in the blood vessels supplying blood to the brain. This is a major illness, needing extra precaution. It can happen to anyone at any point of time. The degree of damage depends upon the area and the extent of damage. For example, someone who had a minor stroke attack can only feel pain and temporary weakness in his arms or legs. However, people who have experienced major stroke can be permanently paralyzed from one side. Stroke is the leading cause of serious disability taking substantial lives. The reported death rate of stroke is almost 5-6% from the total death toll i.e. 1 out of every 20 reported deaths is due to stroke. On an average only in US, one person dies due to stroke within 4 mins. Thus the stroke is the sixth leading cause of death in the world. Out of the total stroke cases, reported almost 87% cases are due to ischemic stroke i.e. due to the blockages in the blood vessels. The risk of having the stroke is also evidently reported to be different for different ethnic groups. The risk of having the stroke has been reported to be almost double in the black people as compared to the whites. The report also shows evidences that the American Indians, Alaska natives and blacks are more prone to have stroke rather than other ethnic groups. There is no evidence of particular age group falling prey to the stroke as it can occur at any point of time. Almost 34% of the people hospitalized for stroke were younger than 65 years of age. Diabetes: – Our body needs glucose for energy. Insulin is the hormone, which is responsible for transporting glucose from blood to the cells. This may lead to the increased sugar level in the blood, which will then ultimately convert into the fat. The increased fat deposition in the blood vessels may cause the stroke. Confusion with vague speaking or listening. Headache possibly with altered consciousness or vomiting. Numbness of the one side of the body covering face, arm and neck. Trouble looking with one or both the eyes. Trouble with walking including dizziness as well as lack of coordination. Pain in hands and legs that can get worsen over the period of time. Weakness in one or both the sides of the body. Trouble controlling or expressing the emotions. Since stroke takes control of the body quickly, it is very important that the diagnosis of the stroke should be made at a faster speed than before. There are some signs available, which can help toward identifying the onset of the stroke. One side of the face droops when the person tries to smile. Drifting of the arm when a person tries to raise both the arms. 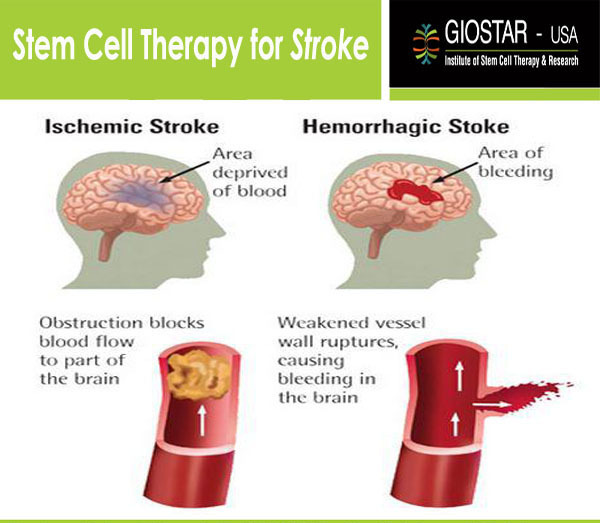 Both ischemic and haemorrhagic stroke require special kind of treatment. However doing the brain scan is the only way of confirming the same. What goes wrong in the Stroke? Hemorrhagic Stroke: – This is a less common type affecting less than 15% of the people, but they are responsible for about 40% of all the stroke deaths. This occurs due to rupturing of the weakened walls of the blood vessel supplying blood to the brain. Due to this rupture, the blood is released in the different parts of the brain causing stroke. This spillage creates instant damage in the blood vessels surrounding the area, causing major death of brain cells or neurons. Ischemic Stroke: – This type of stroke occurs when the vessel supplying the blood to the different parts of the brain is blocked by the clot. Due to this clotting, the supply of blood is halted resulting in the loss of brain cells. Due to life style and environmental factors, this type of the stroke is more common, accounting for about 87% of the stroke patients. However, this is the less severe form of the stroke which can be kept under control by taking precautionary major. The survival rates are higher in ischemic stroke as compared to the other forms. Transient Ischemic Attack: – This form of the stroke has a very short duration involving stoppage of the blood for a very short period of time. This type of stroke is also called as mini stroke. The symptoms of this stroke appear and last for less than 24 hours. This is known to be a very minor attack that is not causing any permanent damage. However, this can be taken as a warning signal for the future stroke attack and hence should not be ignored. The loads of data accumulated from different research suggested, an evidence based differentiation of stem cells into new neurons. The vasculogenetic properties of stem cells can as well lead to formation of blood vessels to improve the paracrine effect, supply of growth factors and immune cells leading to the faster recovery. The angiogenetic properties of stem cells may develop new blood vessels that can help in maximising the supply of blood to the brain.